We’d love your help. Let us know what’s wrong with this preview of Delia and the Drifter by Melody Carlson. Melody Carlson has done it again with this delightful story, taking us back to a wilder time, with characters who capture your heart and unexpected twists that will keep you reading past your bedtime! An arranged marriage to save the family from ruin? To ask other readers questions about Delia and the Drifter, please sign up. The story itself is a sweet romance, with a dash of emotion and suspense. The characters are charming and the readers will love getting to know I received this book from the author/publisher for the purpose of this review. All comments and opinions are entirely my own. Delia and the Drifter is a captivating historical fiction read that wont let you put it down once you start reading it! Delia Blackstone is a young lady who knows her own mind. On the verge of turning twenty one she hasn't been home long from college, something that is quite unusual for most women in 1884. She has always been taught to respect her parents but when she learns that her mother has been grooming her to marry a wealthy older man, she isn't sure what she will do. When a stranger shows Delia and the Drifter is a captivating historical fiction read that wont let you put it down once you start reading it! Delia Blackstone is a young lady who knows her own mind. On the verge of turning twenty one she hasn't been home long from college, something that is quite unusual for most women in 1884. She has always been taught to respect her parents but when she learns that her mother has been grooming her to marry a wealthy older man, she isn't sure what she will do. When a stranger shows up at her door, sharing a secret about her past, and offering her a chance to travel west she decides she will take the opportunity, even though her parents forbid it. During her travels she meets Wyatt Davis a confirmed drifter who seems to be looking for his next adventure in Alaska. While Delia is drawn to him, she knows life is steering her to Colorado, but when she finally arrives at her destination she finds the situation changed, and danger seems to lurk around every corner. Will Delia find what she is looking for in Colorado, or will she be forced to return home to Pittsburgh, and what about the love she feels for Wyatt? 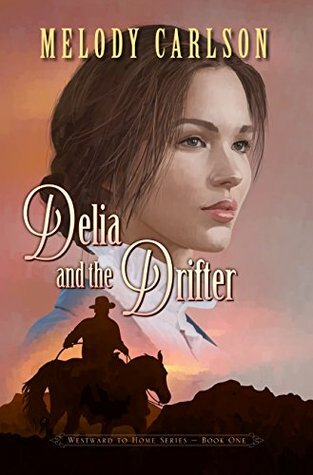 Melody Carlson hits several genres with her fun new book “Delia and the Drifter” — romance, historical and Christian fiction, a little bit of comedy and even some suspense. It’s 1884 and the rise of the steel age in Pittsburgh. Delia Blackstone, who has just returned from two years at university, can’t figure out why she feels like she just doesn’t fit in at home. Her parents treat her as if she is a major disappointment to them, and they can’t wait to marry her off to a rich suitor — no matter h Melody Carlson hits several genres with her fun new book “Delia and the Drifter” — romance, historical and Christian fiction, a little bit of comedy and even some suspense. It’s 1884 and the rise of the steel age in Pittsburgh. Delia Blackstone, who has just returned from two years at university, can’t figure out why she feels like she just doesn’t fit in at home. Her parents treat her as if she is a major disappointment to them, and they can’t wait to marry her off to a rich suitor — no matter his age. But one day Delia receives some major news that shocks her to her core, unraveling everything she thought she knew about herself and sending her on a lone journey to Colorado. During her travels, she meets the dashingly handsome Wyatt Davis, a self-proclaimed drifter who is heading to Alaska’s gold mines to make it big. As Delia and Wyatt each realize an attraction between them is growing, they must both determine where they would like life to take them. “Delia and the Drifter” raises some interesting, thought-provoking topics, including knowing when it’s right and appropriate to obey one’s parents and elders; having and displaying the traits of kindness, strength and courage instead of traits like deception, cruelty and selfishness; pride versus prudence; knowing whom to trust; dealing with heartbreak and rejection; and learning that when God opens a new door, all you have to do is walk through it. Carlson provides a great set of characters in “Delia and the Drifter” — many extremely likable, and some not so much. The book’s plot is also filled with many suspenseful moments and arcs, which I’m not going to spoil here — much of the plot comes as a surprise, so you’ll just have to read the book to find out for yourself. Even though it’s a nice, sweet romance, “Delia and the Drifter” has a bit of a “whodunnit” in it. Clean And Sweet With A Little Suspense!